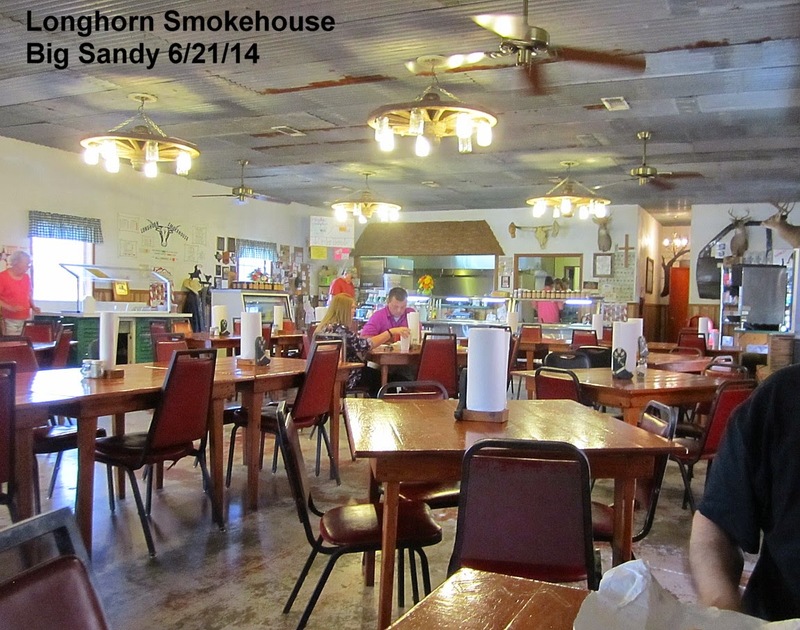 Scott and I had each eaten at a few joints out in East Texas before but we had never done a dedicated trip. The stars finally aligned and we managed to finally get 'er done this past weekend. It is certainly a target rich environment so we will have to do it again soon. 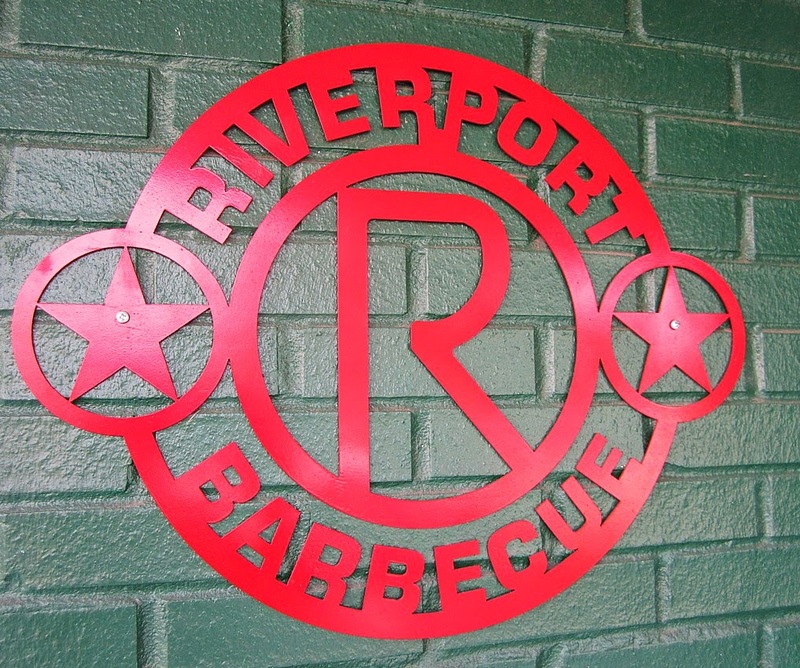 We had a lot of average Q with the highlights being Riverport in Jefferson, Stanley's in Tyler, and Crazy Bob's in Kilgore. 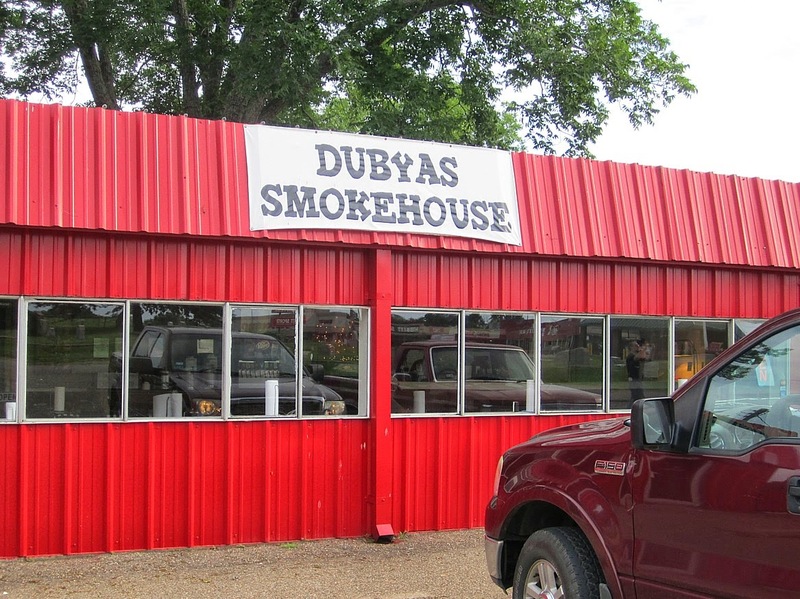 We ate at 7 different joints on both Friday and Saturday and a total of 17 over the 3 days. We found 4 other joints closed and pulled up on another place just as a bus full of boy scouts filled it up. I added this trip onto one of my many Lake Fork fishing trips so I had to pick up Scott at the Amtrack station in Mineola at 5:15 on Thursday, June 19. The train was 45 minutes late, but it was just a short trip down the highway to our base in Tyler for the next 3 nights. That required a bit more driving than moving around, but it also meant I did not have to load and unload my fishing stuff multiple times. We carried around a cooler for leftovers and stored them in the mini-fridge overnight. I think we each came home with about 5 pounds of meat. 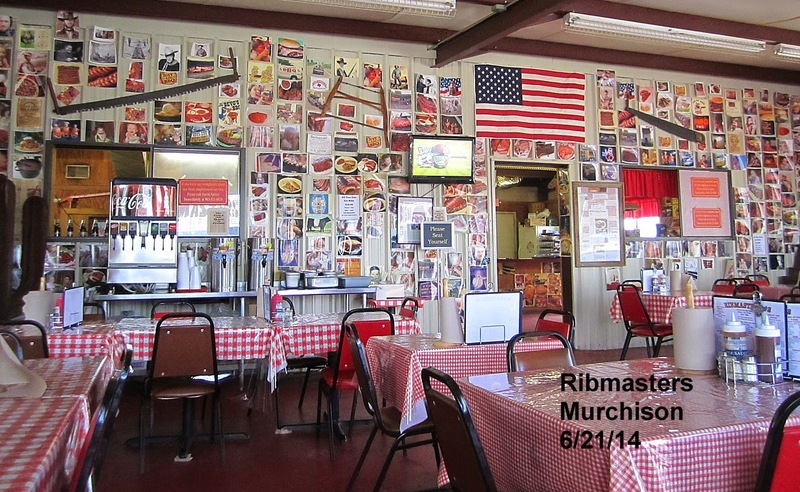 Scott's goal is to try to eat at all 50 of the recent Texas Monthly picks. 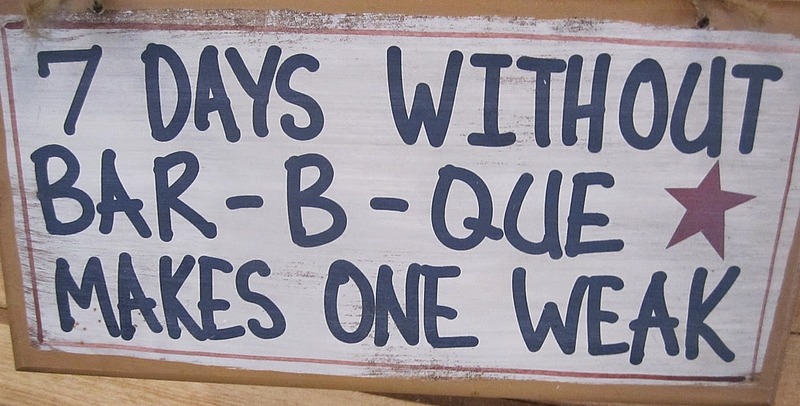 Mine is less ambitious, I just want to eat a lot of good BBQ and try every spot we come across on our travels. What follows is a joint by joint travelogue with lots and lots of pictures. As always, you can click on any photo for a larger view. 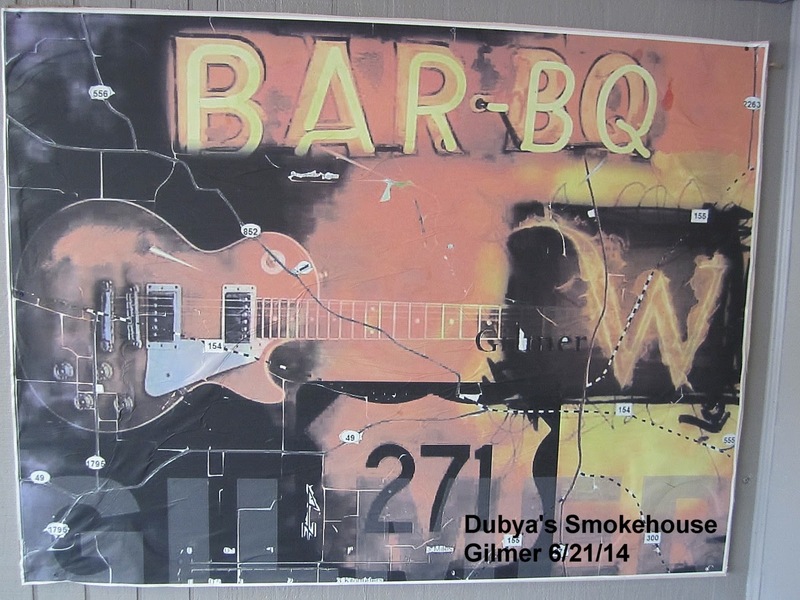 This joint won the prize for funkiness and I felt it was the perfect BBQ juke joint. All they needed was some Elmore James on the jukebox, but there was no jukebox. 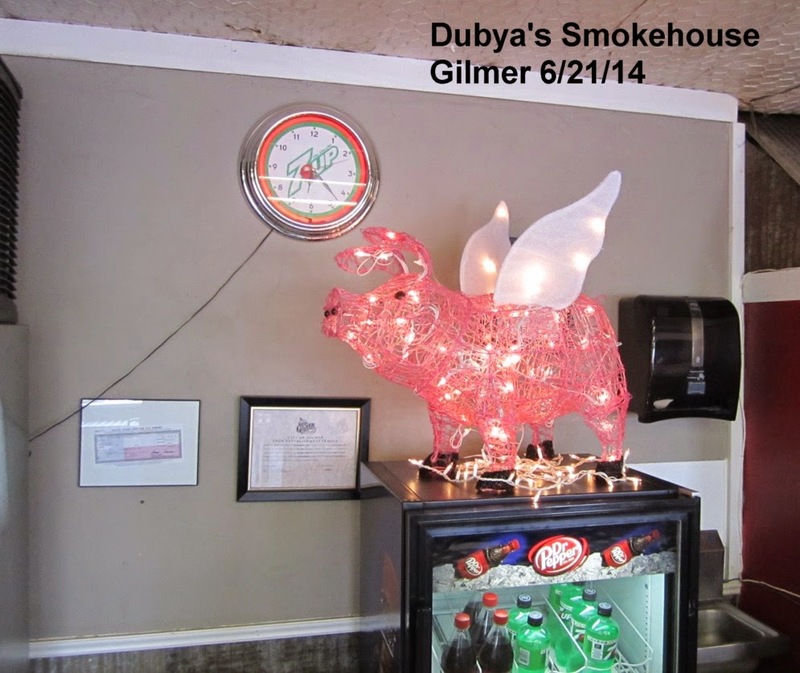 The pit room was adjacent to the dining area so anytime they went to get meat the place was flooded with smoke. 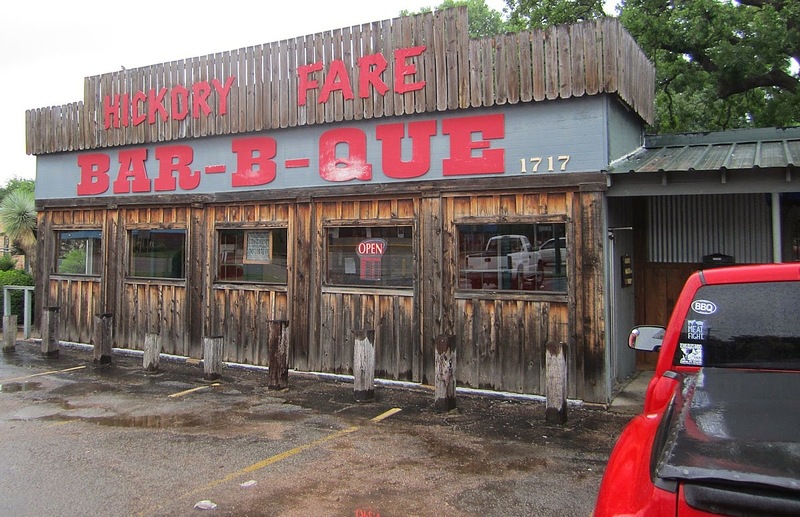 It smelled like BBQ in there. 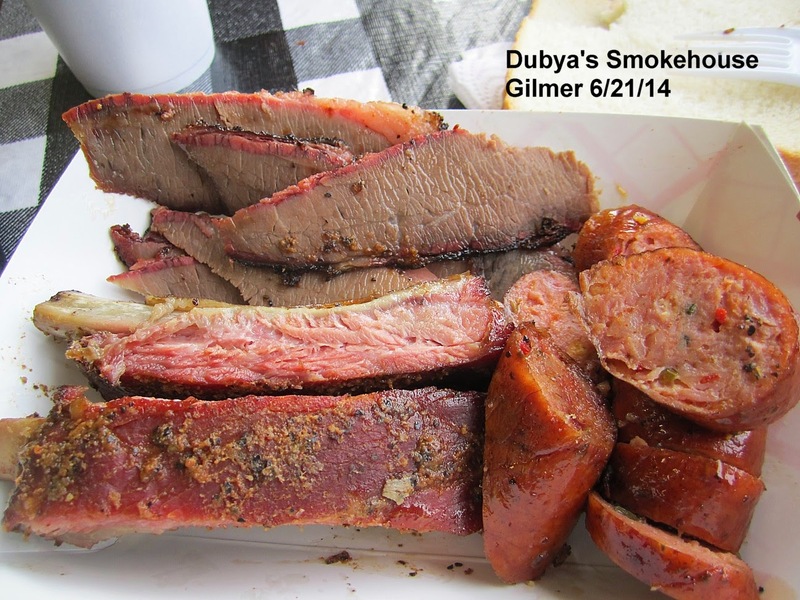 I got a 3 meat plate with hot link and found the brisket to be very tough and chewy. The ribs were better and had decent smoke flavor. With all the smoke in the dining room I bet my shoes had good smoke flavor, too. The hot link had been cooked to crispy and was excellent. Just the way I like 'em. Just enough spice and a crispy crust on the outside. My food picture here was not too good. My camera was probably confused by the smoke. 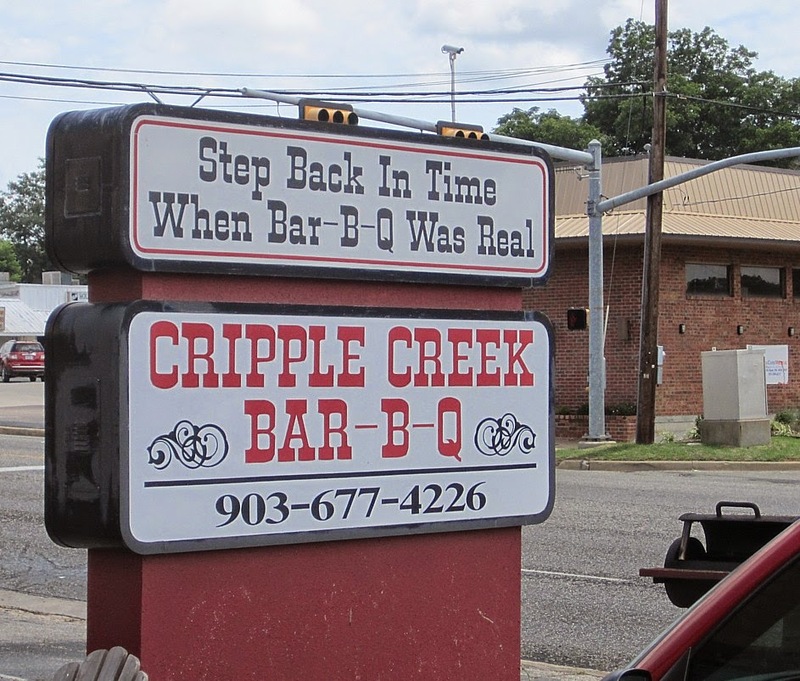 This place was right down the street from the hotel we stayed at in Tyler and we passed it every day in our travels. 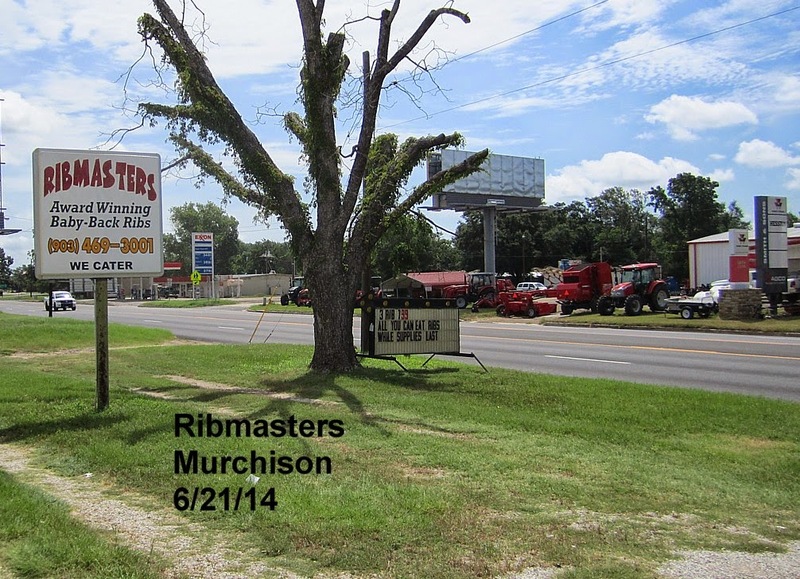 It was one of the few joints to be open on Sunday so we saved it for our last day. 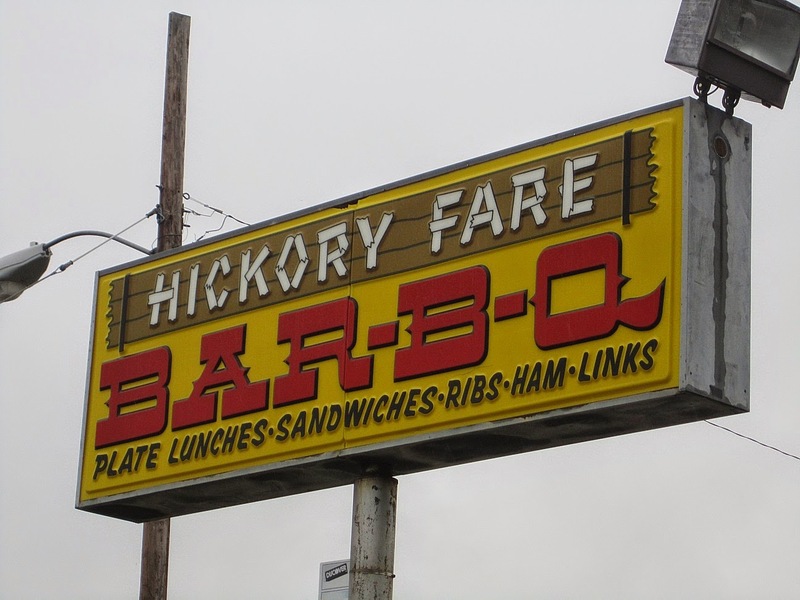 Scott passed on this stop and I got the usual 3 meat plate. 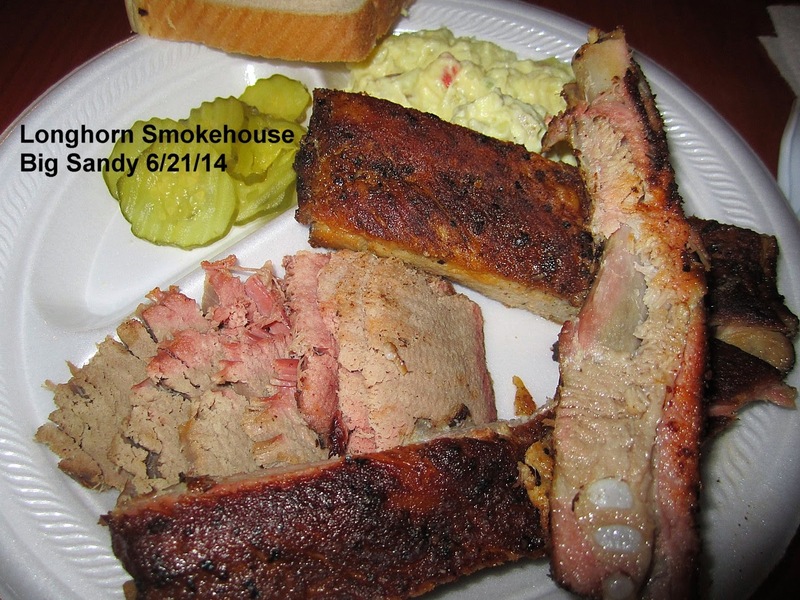 The brisket was roast beefy with no smoke flavor but decent tenderness and moisture. Ribs and sausage were average. 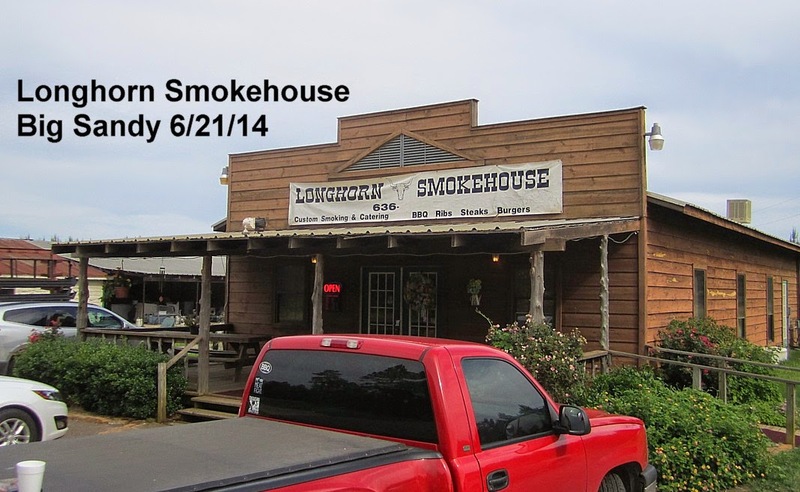 A good average Q joint and on Sundays in East Texas you have to take what you can get. 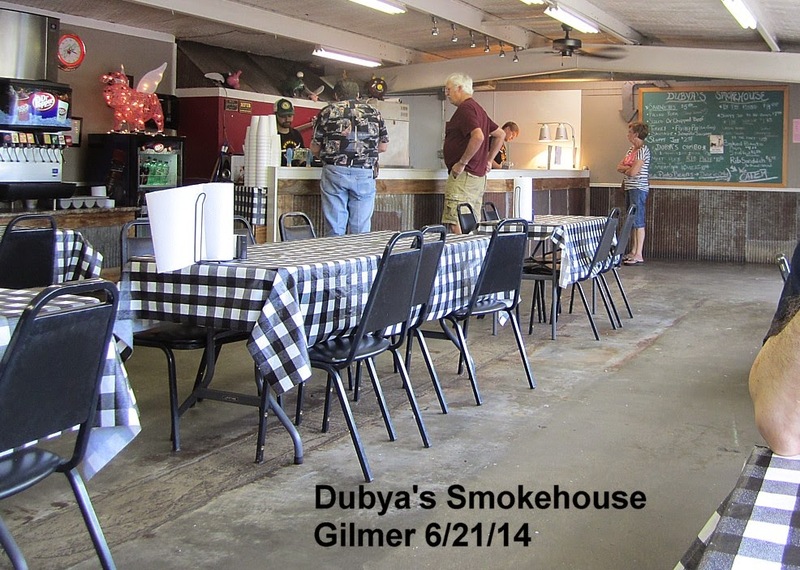 After driving around Gilmer a bit with Freddie King on the stereo, we finally came across Dubya's Smokehouse on the north side of town. 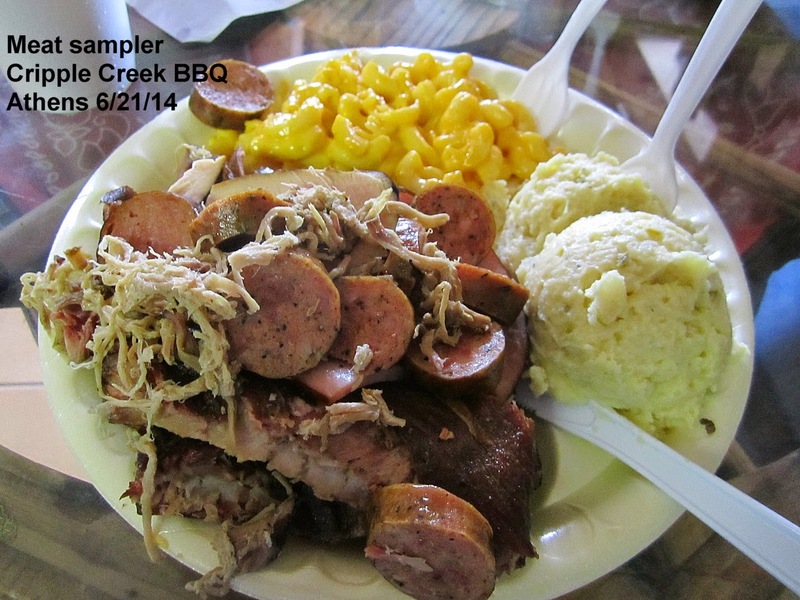 I got a 3 meat plate with jalapeno cheese sausage and it was pretty good. 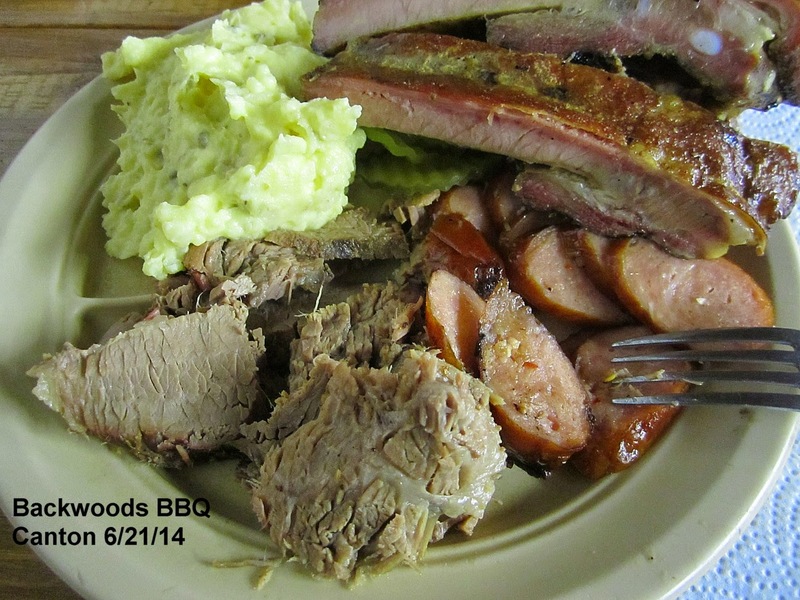 This was some of the better brisket on this day with a lite smoke flavor and good moisture and tenderness. Same with the ribs which were also tasty. 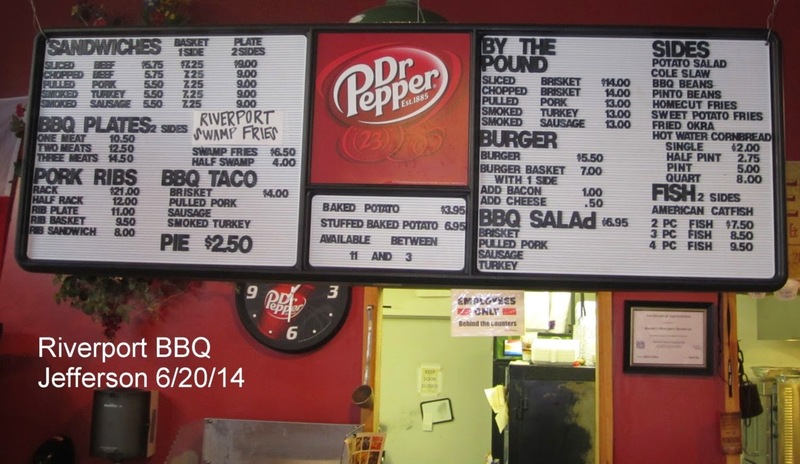 The jalapeno cheese sausage was nowhere near Kreuz, but it was still pretty good. I asked the guys where it was from and they said it was a Sysco product. I would not have guessed that. 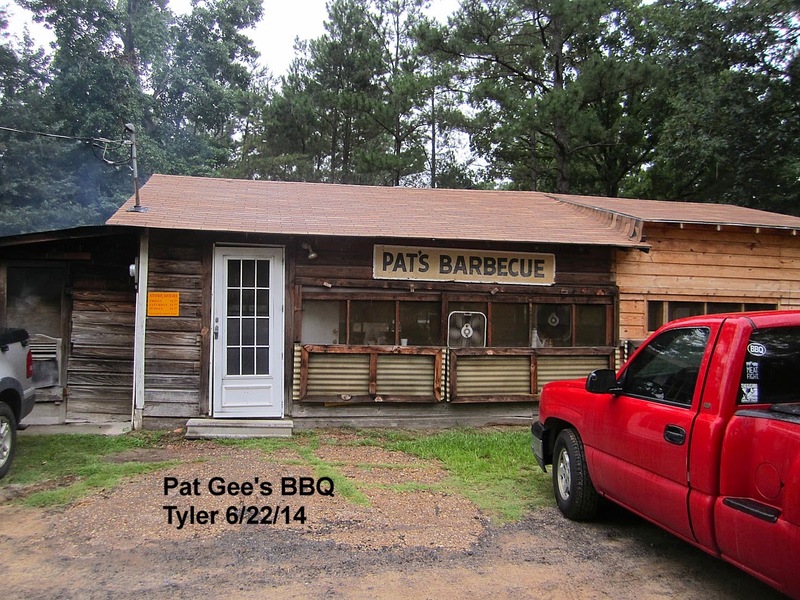 Another nice friendly place out in the country several miles west of Gilmer. 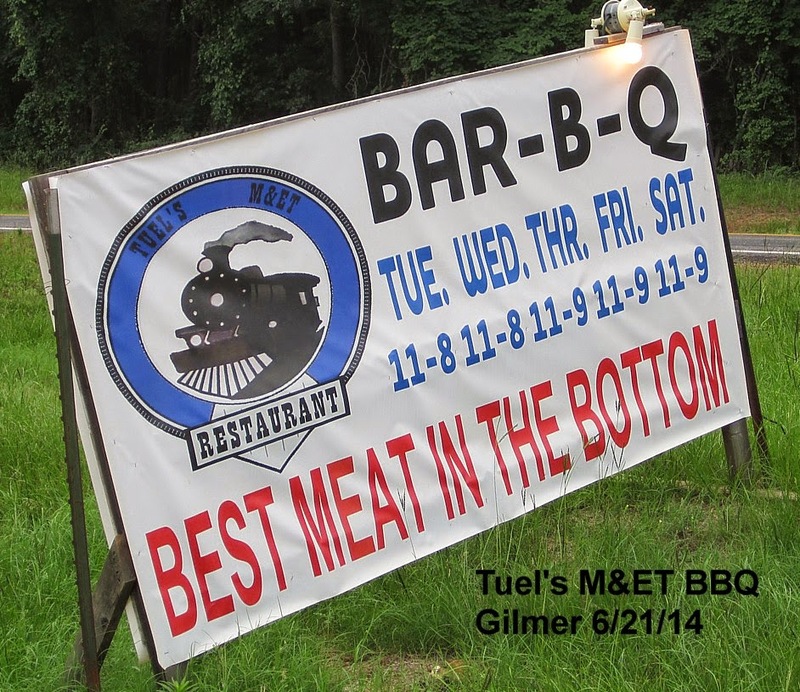 They have a sign if you are coming east into Gilmer, but it comes up pretty quick when you're going west so we had to deploy the BBQ chutes once more. 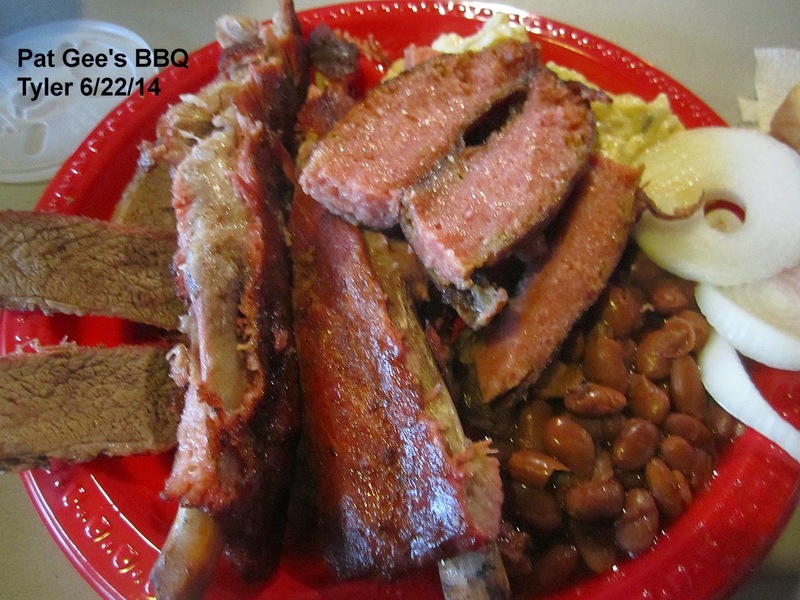 I got the 2 meat plate with brisket and ribs, but only because I didn't see "The Will" which is their 4 meat combo. 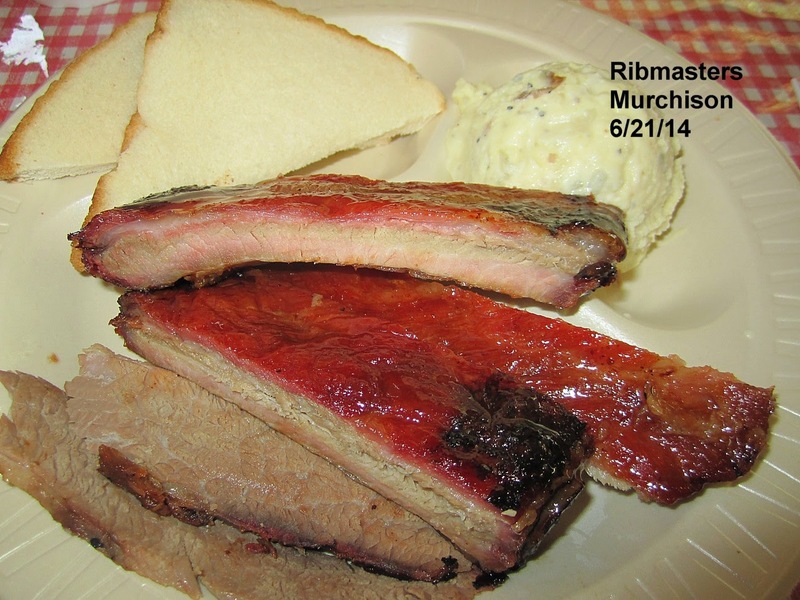 The brisket was tough and chewy but the ribs were much better. They had nice moisture and tenderness and left a good bite mark. The "mexican corn" was an interesting side I had not seen before. Corn with melted cheese and jalapeno was a good tasting side. 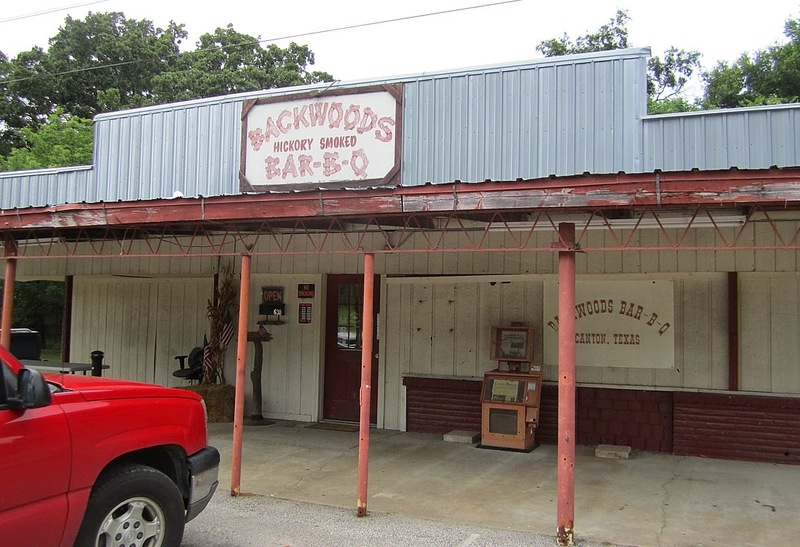 This place is actually a few miles north of Big Sandy between there and Gilmer. Inside they had a wider variety of cowboy stars on the walls than usual, with Gene Autry, Roy Rogers, Hoppy, and more joining the usual John Wayne displays. 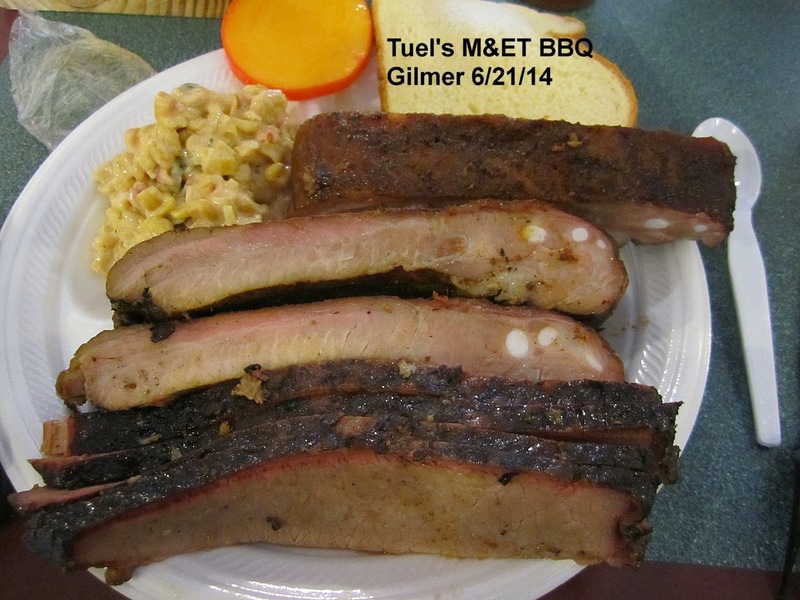 I went for the 2 meat plate with ribs and brisket and was pleasantly surprised by the quality that late in the day. 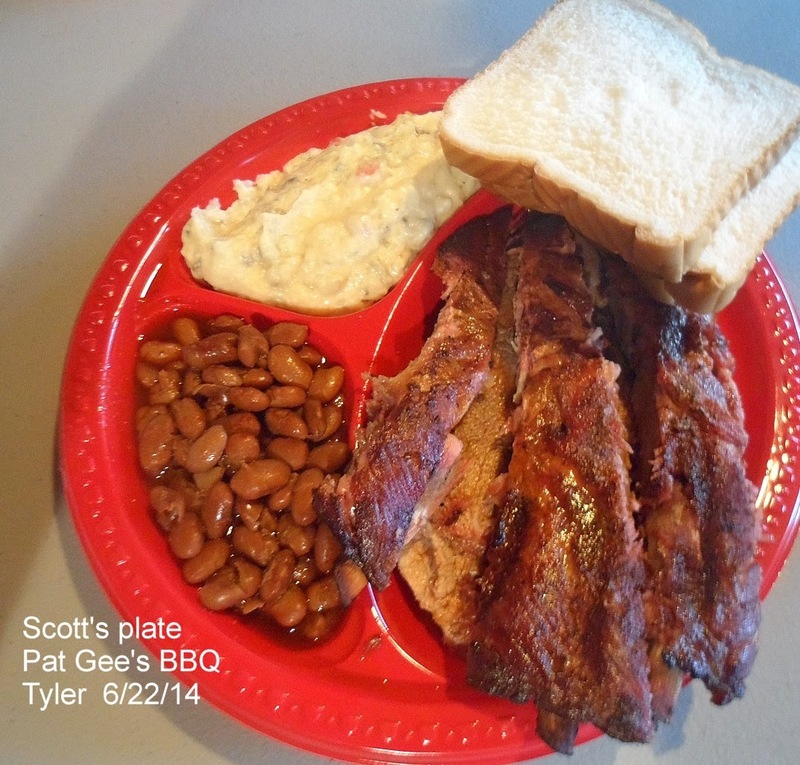 The ribs were excellent with good moisture and tenderness. 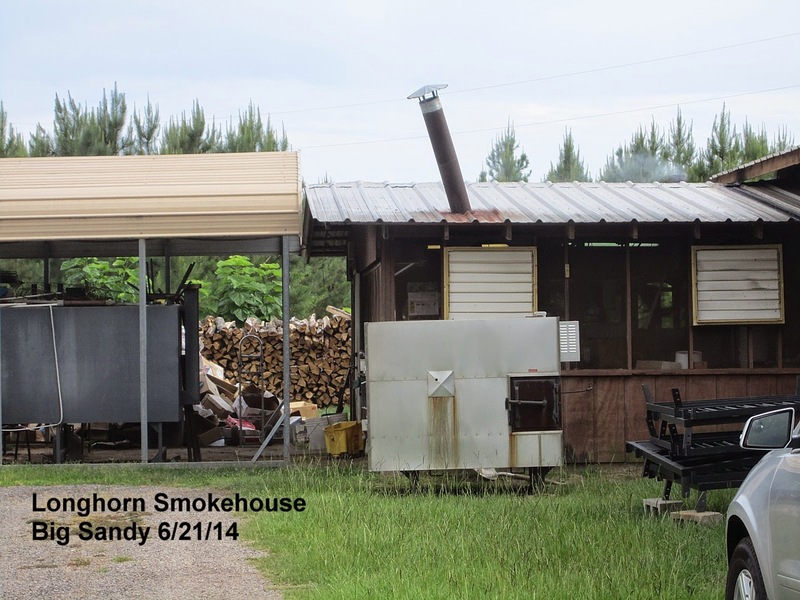 I think these were some of the best ribs on the trip. 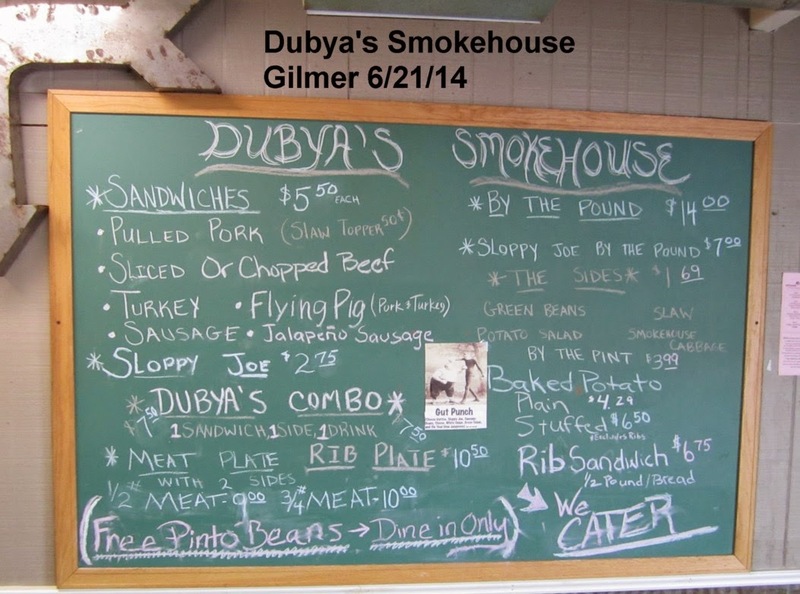 The brisket was a bit crumbly with no smoke flavor. Tater salad was a bit better than average. 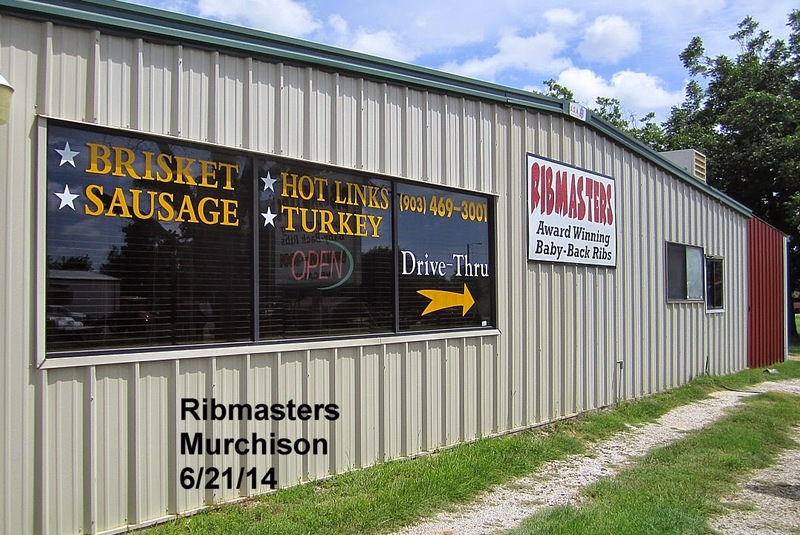 We didn't ask around (we never do) but it appeared theses folks are regulars on the competition BBQ circuit. I liked their trailer. 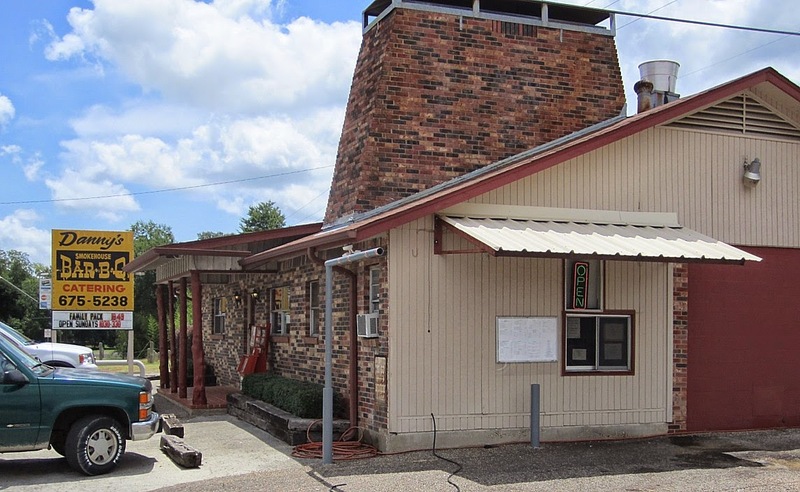 We found Rod's BBQ and Sekula's BBQ and country store MIA along 64 in Canton. 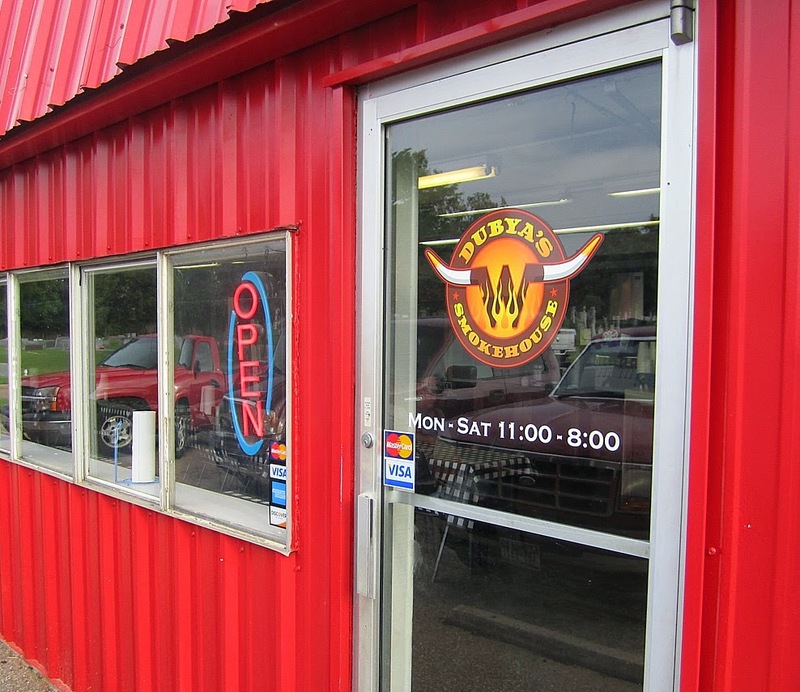 Rod's has been replaced by a cajun restaurant. 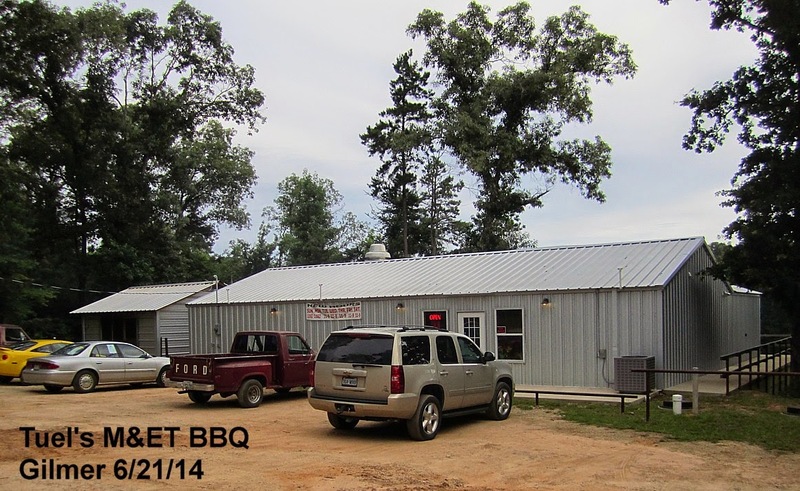 DJ's BBQ we found had moved up on the east side of hwy 19 between I-20 and the First Monday parking area. It was not open when we were there on a Saturday, so I assume they are just open on First Monday weekends. 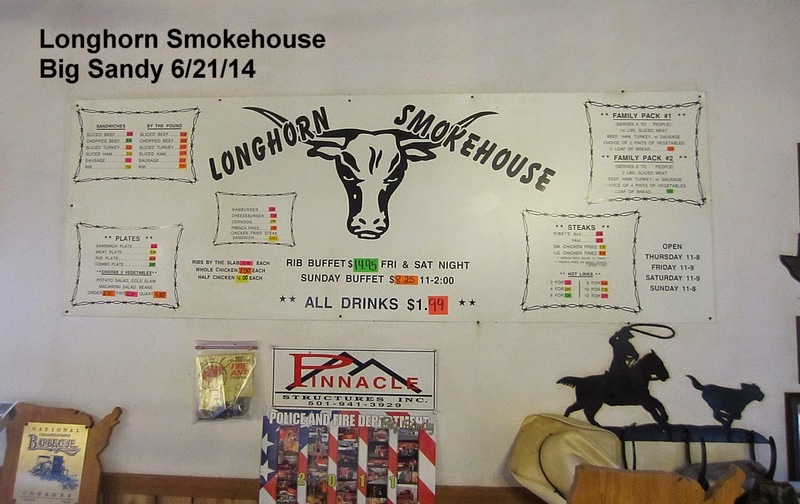 Another nice friendly place with decidedly average food. 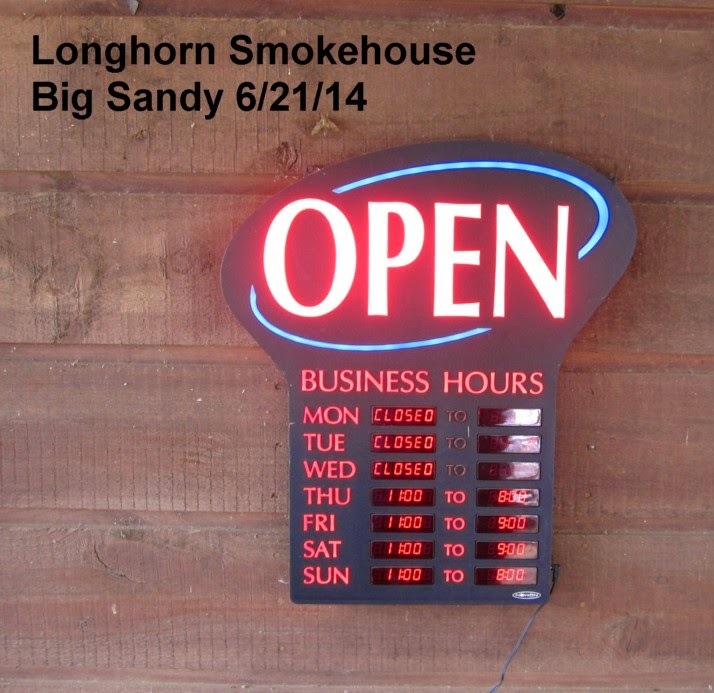 The brisket was overcooked and crumbly with roast beef flavor and no smoke. A little dry, too. The ribs were better with decent moisture and tenderness. Sausage and tater salad were average. Not much to say here. The ribs were dried out and tough. So was the brisket. The sides were not very good. Hopefully they were just having a bad day. 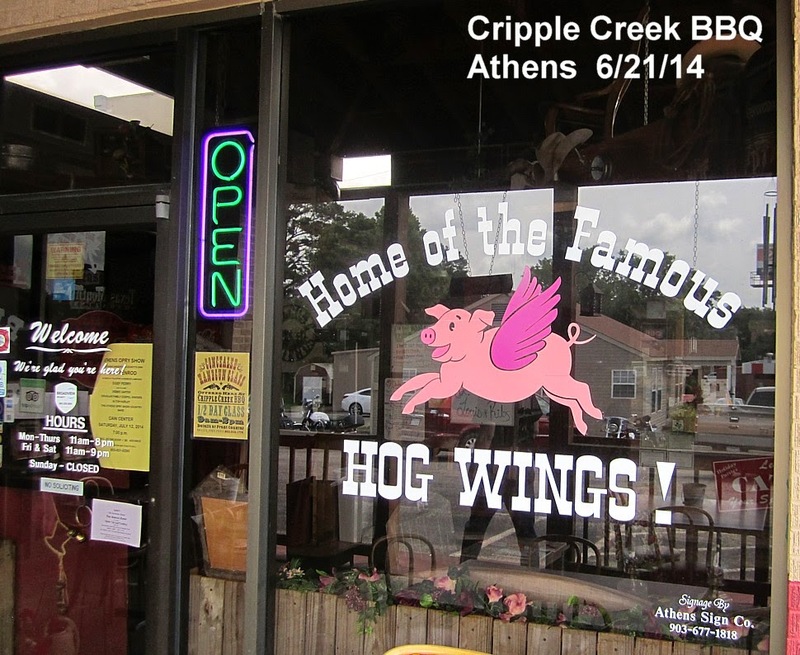 So what exactly are hog wings? I'm still not really sure but I think I sampled some. Maybe. 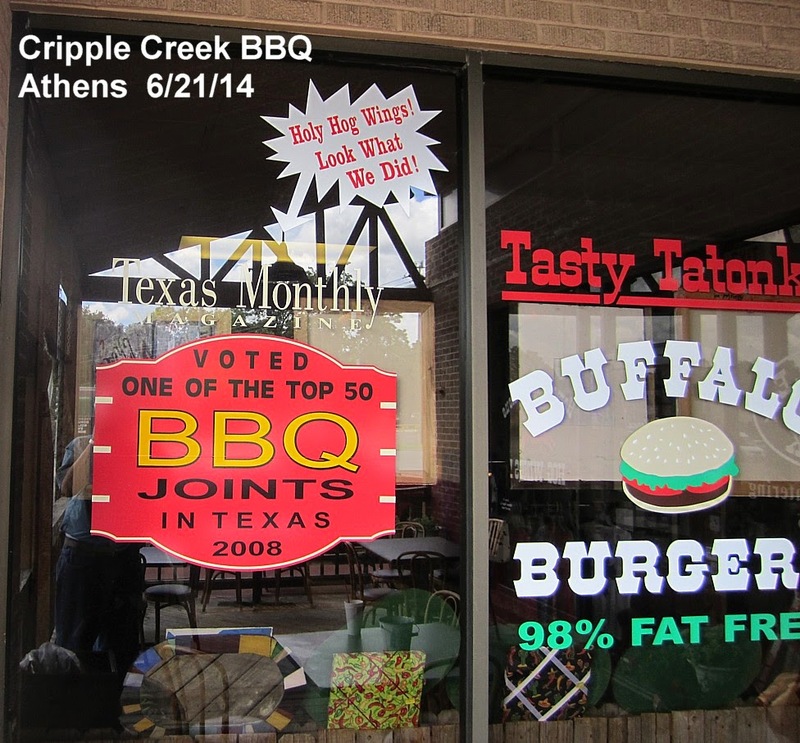 This 2008 Texas Monthly top 50 joint was no longer worthy in 2013 but they're still proud to display that sign from 2008. 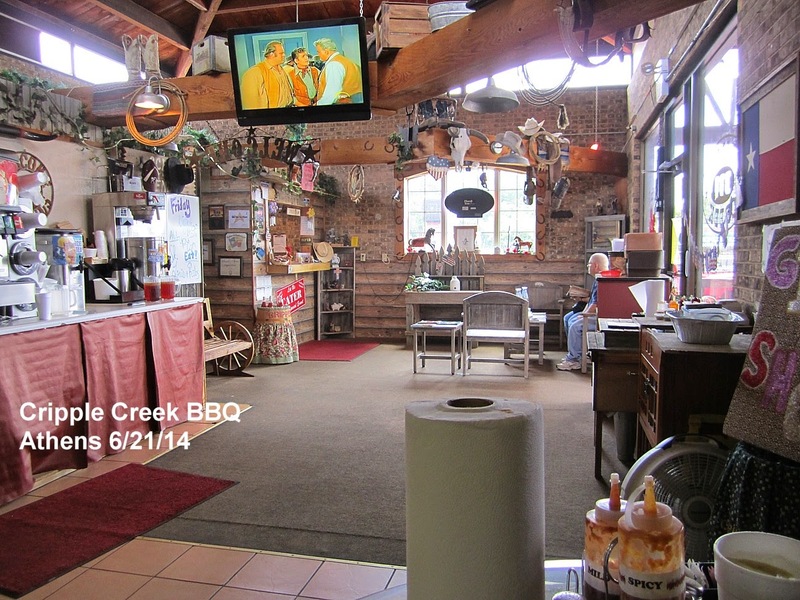 Inside it's a potpourri of western kitsch and they even had old Bonanza episodes running on the flat screen. 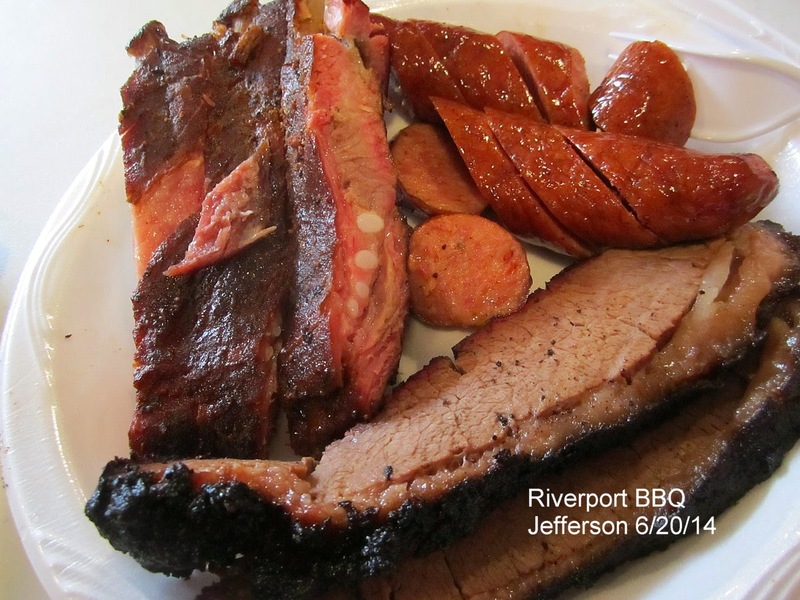 They offered a meat sampler plate and that seemed to be right up my alley. However I was a little taken aback by what I received. This was a mountain of food, none of it bad, but none of it really great either. I also think the presentation leaves a lot to be desired. In that pile of meat I found turkey, ham, sausage, hot link, pulled pork, ribs, but strangely no brisket. I dug through that pile pretty good and never did find any! 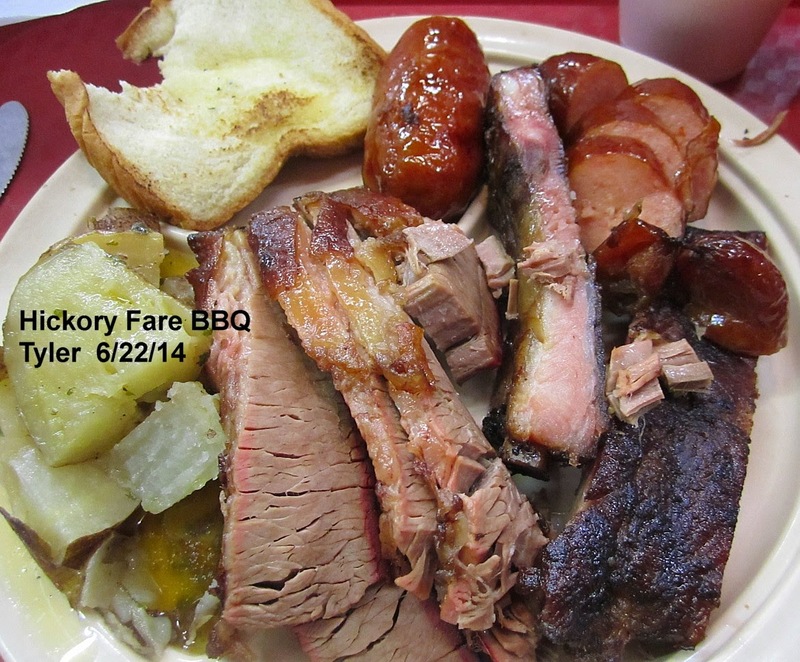 Scott had gotten a 2 meat plate and shared some of his brisket and it was tough and chewy with no smoke flavor. The ribs were overcooked and the meat fell off the bone when I tried to pick one up. The sides were very average. 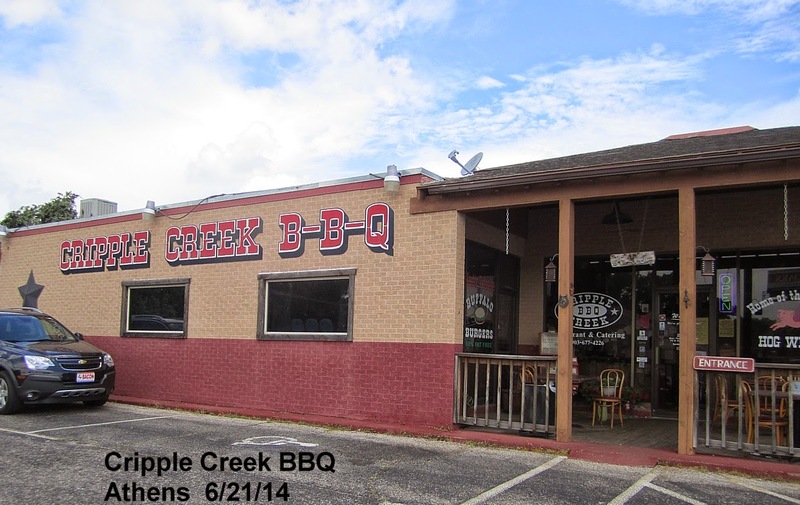 I think if you're looking for a good average meal this place will fill you up but it didn't satisfy us BBQ snobs. 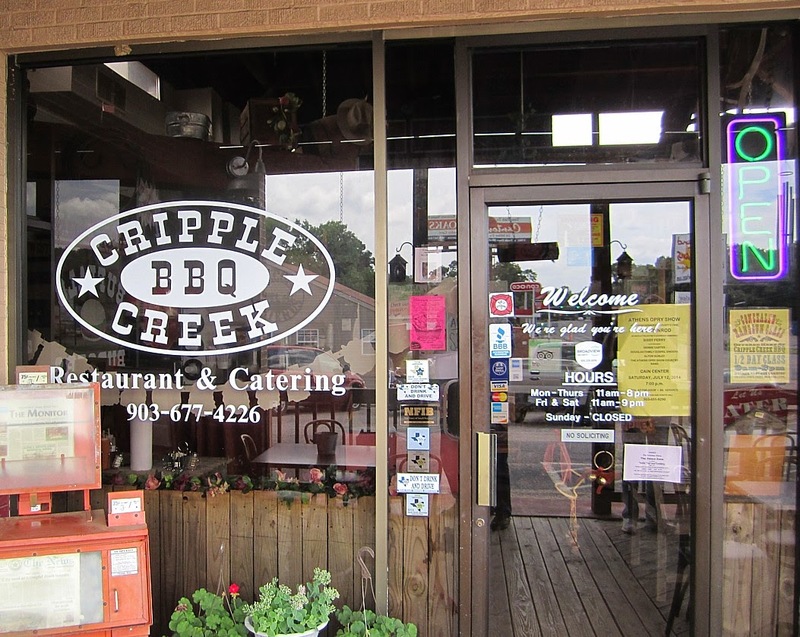 Another place we came across on the road between Tyler and Athens and our first stop on our second full day of the trip. It was actually just a little before 11 am opening but the door was open and we wandered in. 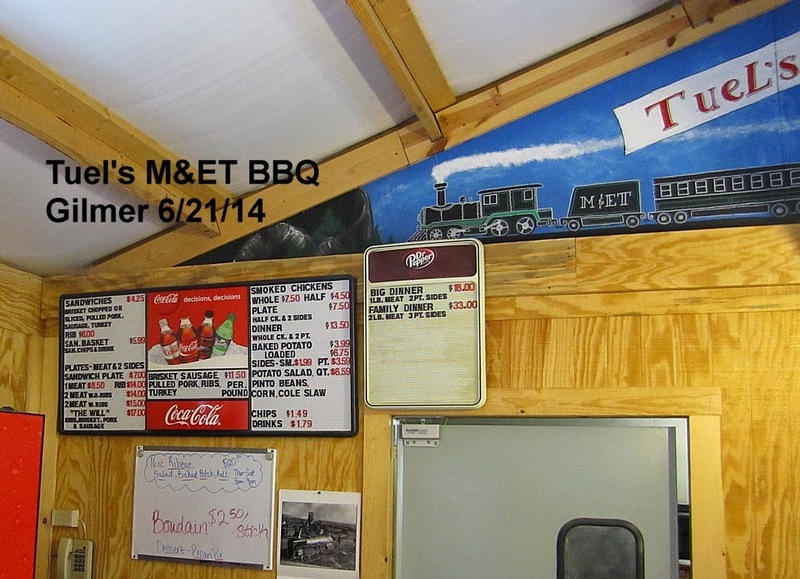 The walls are decorated from stem to stern with laser printed photos of BBQ and cowboy movie stars from all over. I ordered a two meat plate of ribs and brisket with no sides. The waitress told me that they MUST bring me one side so I said, OK, make it tater salad. After what seemed like a long wait, the plate arrived and the ribs did indeed look nice. There was a sweet candy glaze and they bit well with good tenderness and moisture. The brisket was another matter. It was cut very thin but was still tough. There was zero smoke flavor in either item. Apparently this is a small chain with 2 or 3 locations. A quick perusal of the interwebs finds other editions in Bullard and Whitehouse. 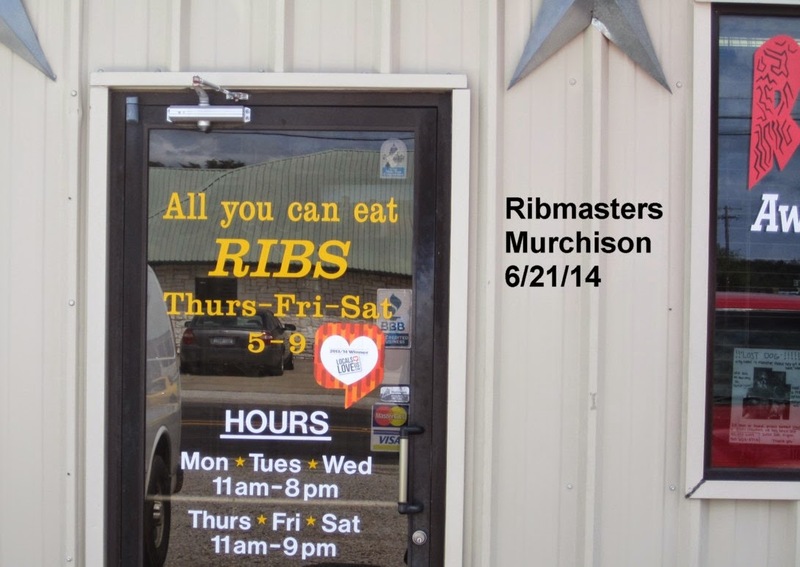 If you look around online you will find they even have a rib eating contest. The current winner gnawed 31 bones. Impressive enough that I won't give it a go, but those were some pretty good ribs. Service was pretty slow. 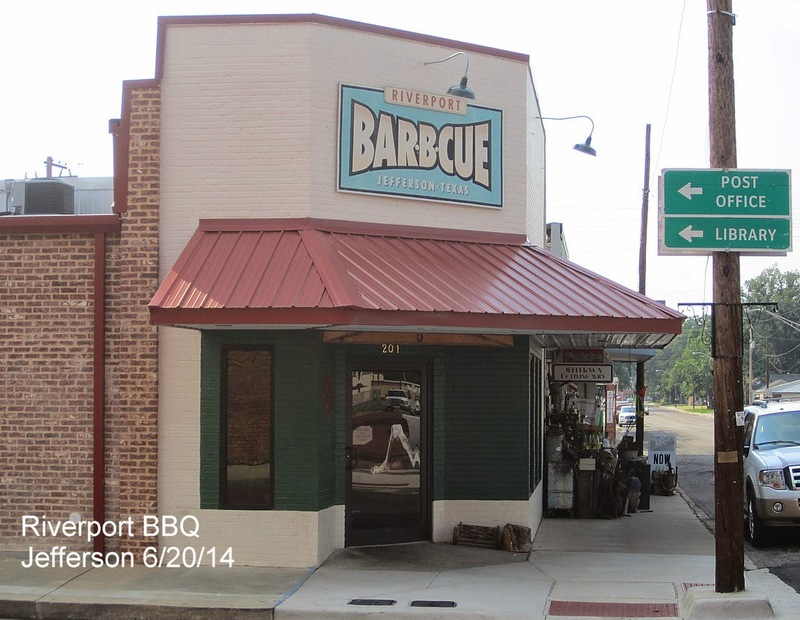 This joint is now Chick's BBQ and has new owners. 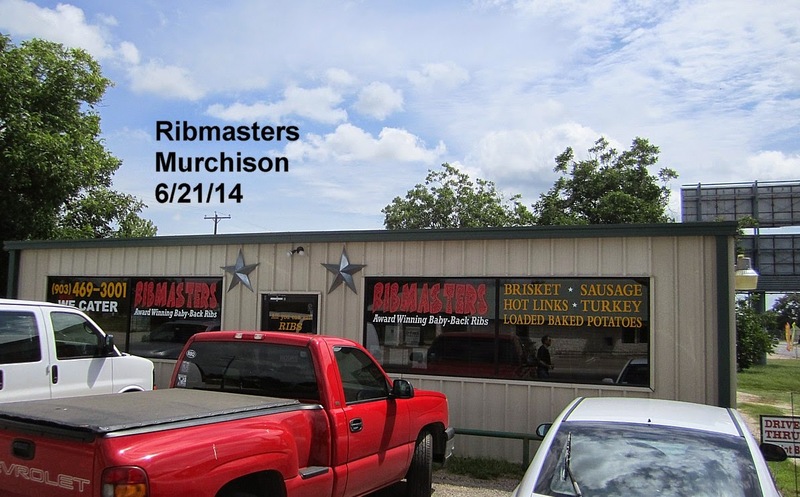 Another one of Scott's top 50 joints and another place we had sampled at the recent Red Dirt Festival in Tyler and at the Pitmaster's Picnic in Dallas. They had a $12.99 special on the 3 meat plate so I got that with no sides. Since I skipped the sides they gave me my sweet tea for free, which I thought was nice. Definitely a bargain, especially since this was the best meal I had on the whole trip. 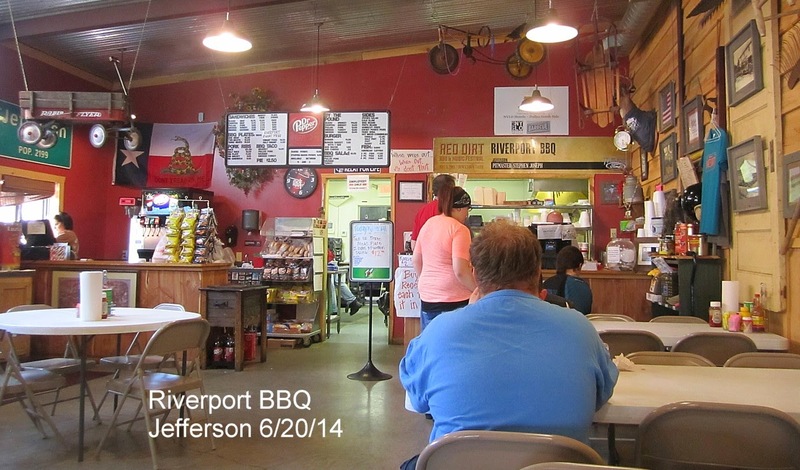 The brisket had deep smoke flavor and the fat was well rendered to melt in your mouth status. The pull apart test was spot on and the brisket was tender and moist. 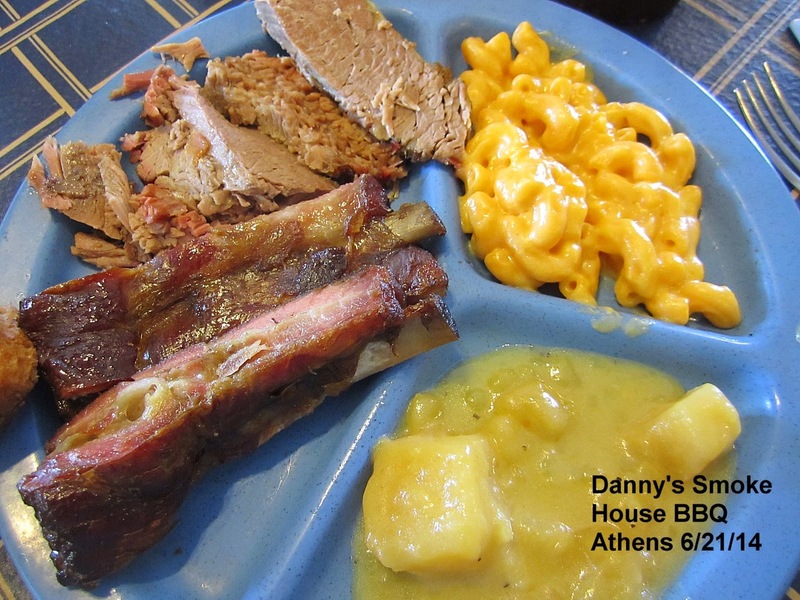 The ribs were equally nice but without any smoke flavor. Sausage was average. 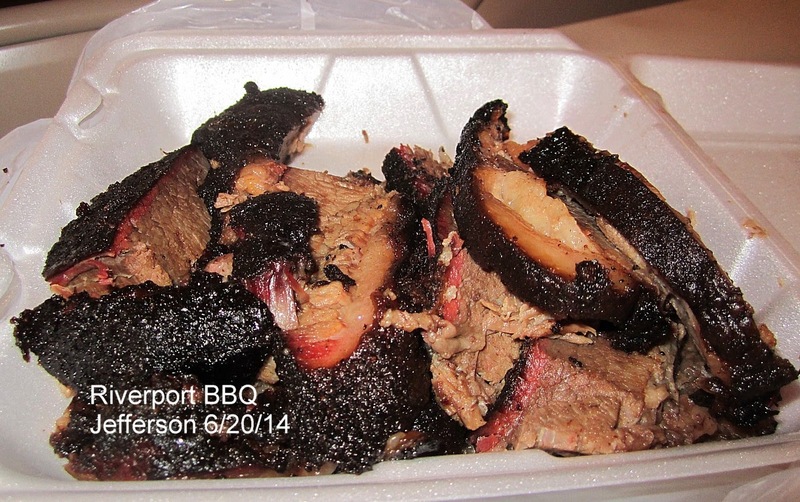 Scott liked the brisket so much he got an extra pound to go. The box they brought out was simply amazing. Click to enlarge for the full effect. That was a sight to behold. 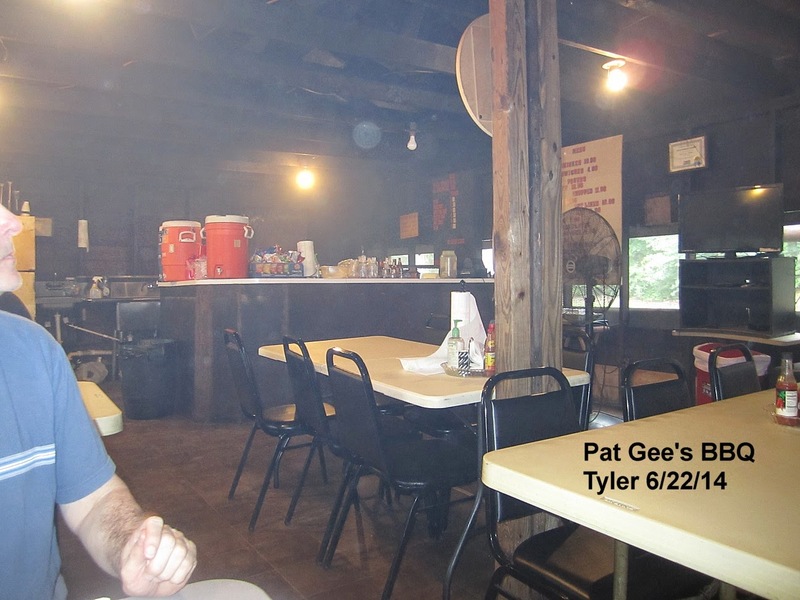 Pitmaster Stephen Joseph recognized us from Red Dirt and Pitmasters Picnic (that was a first) and he stopped by to visit a bit. 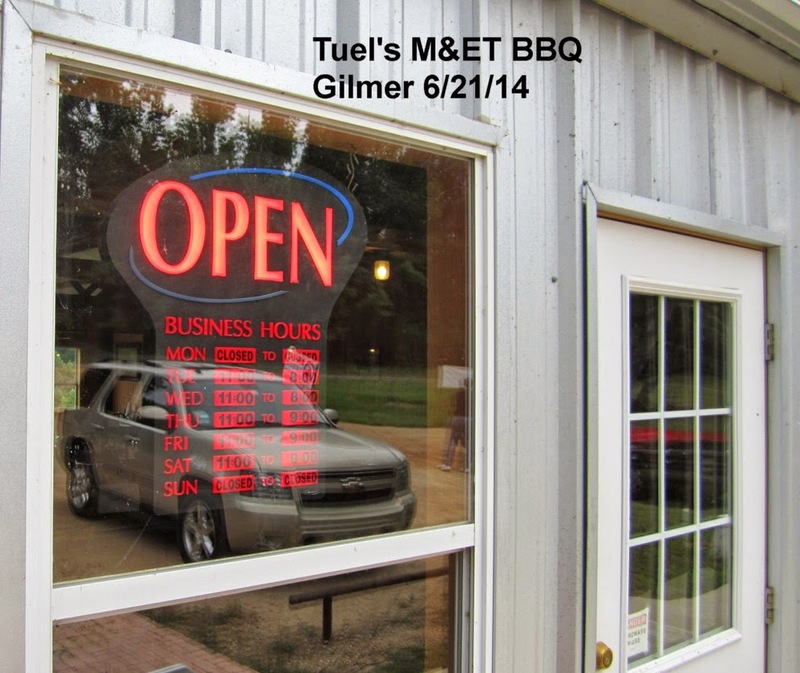 We had a nice BBQ chat and had a chance to thank him in person for the great food. Scott and I agreed this was the best food we had on this trip out of 17 places sampled. 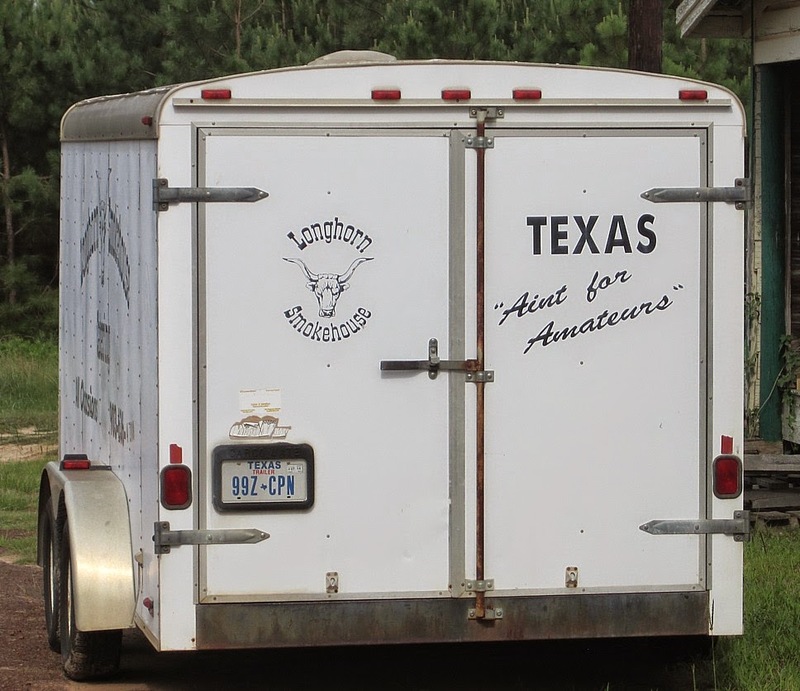 Look out East Texas here we come!